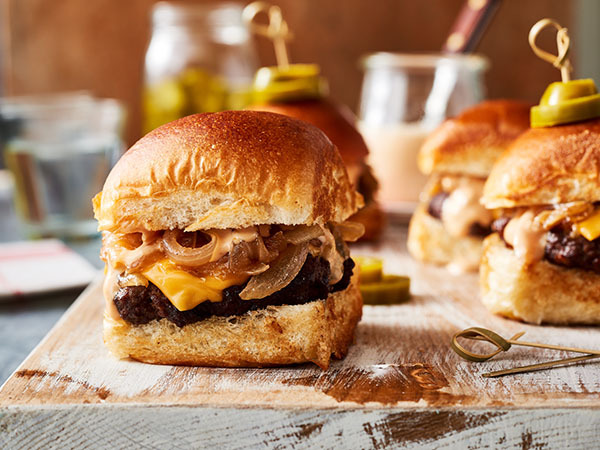 To begin Dale's Pull Apart Beef Sliders, heat a medium skillet over medium heat. Then, add the butter, then the onions. Next, cook until the onions start to soften and look translucent, about 5 minutes. Reduce heat to low and let cook, stirring occasionally, about 20 minutes. Then, add 1 teaspoon of Dale’s seasoning and continue to cook another 5 minutes. Preheat the broiler to high, with the oven rack positioned 6” from the heating element. In a medium bowl, gently combine the ground beef, 3 tablespoons Dale’s seasoning and black pepper. Line a large baking sheet pan with foil. Form the meat into 16 equal sized patties, (about 2oz each or ¼ cup each). Form the patties to be slightly wider than the bun, with a small indent in the center. Arrange in rows in the center of the sheet tray. Place under the broiler for 3 minutes. Turn to the other side, and broil 2 more minutes. (Patties should be slightly undercooked at this point, as they will return to the oven later). Transfer sliders to a plate and replace foil on the sheet tray with clean foil. Reduce oven temp to 375°F. Slice the slider rolls in half cross-wise. Arrange the bottom halves tightly together on the baking sheet. Top each bottom half with 2 small slices of cheese, a slider, another 2 slices of cheese, and small spoonful of onions. Top with the top buns and push the sliders together so that they touch in a square. Cover tray tightly with another piece of foil and return to the oven for 10-12 minutes, until cheese is melty. Meanwhile, in a small bowl, whisk together the mayonnaise, ketchup, mustard, pickles & their juice. Place sliders on cutting board to serve with the sauce on the side.